The question of alcohol and tobacco companies cashing in on cannabis has become a question of who hasn't, not who has at this point. Cannibalization conscious beverage giants have poured into the cannabis craze in 2018, counting Constellation Brands (STZ) , Molson Coors (TAP) , and now Anheuser Busch InBev (BUD) touching the THC and CBD driven industry from the alcohol side. Meanwhile, companies like Altria (MO) have ensured their bottom line isn't burned either. J. Smoke Wallin, president of cannabis compliance, cultivation, and branding company Vertical Companies, told Real Money in an interview earlier this year that he expects all alcohol companies are looking at the space and positioning themselves for the potentially disruptive effect that companies like Canopy Growth Corporation (CGC) , Cronos (CRON) , and Stock of the Day Tilray (TLRY) could have on the age-old industry. "The reality is that they are not going to have a choice," he explained. "They're going to have to look into cannabis, either as a leader or a follower." With that said, establishing who the stragglers are and what impact they might have is key. Diageo plc (DGEAF) has been rumored to be a suitor to numerous cannabis companies, including the Coca Cola's (KO) rumored target in Aurora Cannabis (ACB) . The U.K. based beverage giant and maker of Guinness was recently rumored to be visiting Canada in the interest of staking out a potential partner for its own experiments with the green stuff. With Canadian cannabis kings Tilray, Cronos and Canopy Growth already spoken for, Aurora and the Ontario-based Aphria (APHA) are the largest players remaining. Running, not walking as their Johnnie Walker mascot suggests, toward the remaining players could be a pivotal move for the company as the space gets increasingly crowded. On the tobacco end, British American Tobacco (BTI) could be a company to light up a partnership before it sees its industry go up in smoke. With Altria already beginning to corner the vape market alongside JUUL labs, the company could do well to cut off their chief competitors advances into cannabis as well. This is especially imperative given the stock's abysmal performance this year, falling over 30% in just the past six months as a combination of cannabis and vape cannibalization eats into its results and a potential menthol ban threatens to destroy some signature brands. As nations like New Zealand begin to engage their own referenda on cannabis legalization, the company could be positioned as one of the few with the necessary supply chains and on-the-ground infrastructure to supply to some of these oft-neglected global markets. Once more on the beverage end, French alcohol purveyor Pernod Ricard (PDRDF) could be a player in the cannabis market. The company is clearly cognizant of the cannabis industry, given its open commentary on it at a recent shareholders meeting. Still, the company was non-committal. "To date there is no evidence that the legalization of cannabis will have an impact on the consumption of premium spirits. We continue to monitor it," CEO Alexandre Ricard said in November. "We must give ourselves 12-18 months to be in a position to assess it." Unfortunately, as the cup of companies pouring into the space overflows and the pace of legalization, especially in the United States, accelerates, the maker of Absolut Vodka might not be afforded the luxury of time as forecasts of full legalization coincide with that timeline. 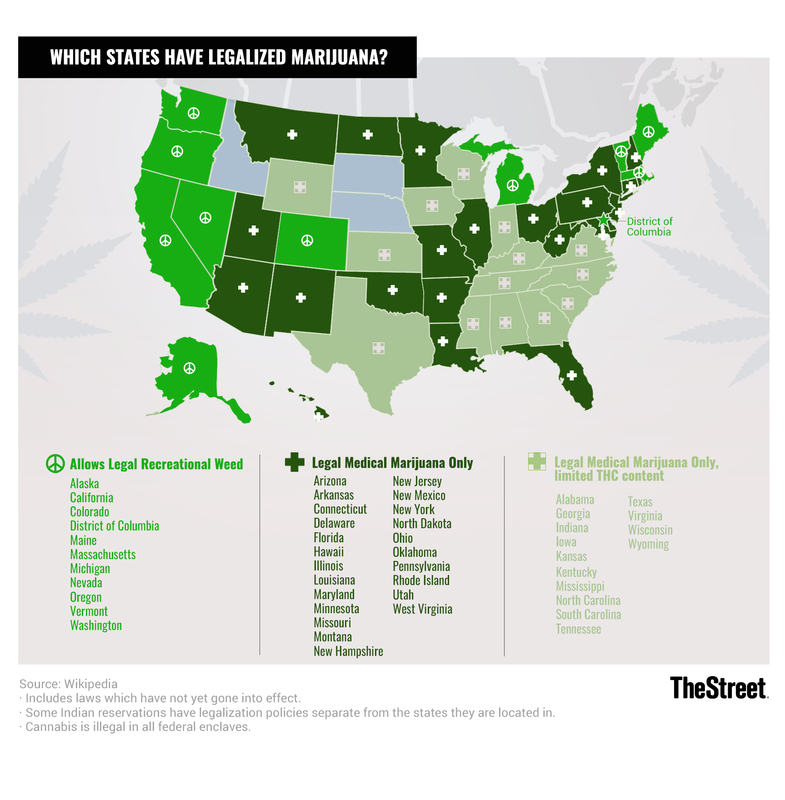 "Earlier this year, I would have said [legalization is coming in] three to five years," J. Smoke Wallin told Real Money in an interview after the U.S. midterms. "Fast forward to now and I think its 12 to 18 months." With such a forecast in mind, it might be high time for companies like Pernod Ricard to step outside of the comfort zone for a smoke before closing time comes and the door to opportunity closes.